Practically everyone understands the importance of “doing content marketing,” but many – even those with documented content marketing strategies – don’t know how to align the types of content they create with their desired content marketing goals. For example, some of the best content for drawing in and nurturing qualified leads – like webinars – underperforms when it comes to link building. By contrast, publishing new data and research is a great way to build a robust link profile. 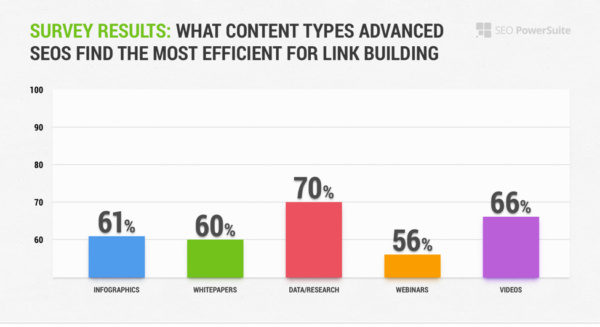 Those are a few of the new findings from my team’s new Link Building Survey, in which we polled 628 SEO experts across various types of businesses to understand better how they build links for better SEO in 2017. What follows are the five types of content these experts say are best at growing their own links. Infographics are one of the most popular types of link-building content. Over half (53%) of the SEO experts create cornerstone infographics and 61% of those find them to be an efficient means of earning backlinks. In our outreach efforts, we’ve tried with data, video, infographics (with embed code) and many other things. It worked well, but when we tried data and stats in infographics and reaching out to share the infographics with our personalized custom description for each website, the response and success rate just exceeds all of our past results and expectation. As soon as Jubaer began distributing these infographics as “guesto-graphics,” content ROI increased dramatically – earning hundreds of backlinks from dozens of different domains. One of his infographics has received nearly 1,000 backlinks from over 300 referring domains. Pick a topic highly relevant to your target audience and make it as specific as possible (e.g., if your niche is social media, focus on a single platform that’s hot). Gather data points (preferably plucked from original research) about your topic. Wireframe your data points to flow logically down the page. Make it look great. Use large fonts and visually represent all key stats so they jump off the page. TIP: When designing an infographic, you can use free tools like Canva but you may want to hire a designer (or use an in-house designer) for a more customized, professional look. Once you’ve created your infographic, you need to decide how to distribute it. If you want to create guesto-graphics, like Jabaer, do some cold outreach to key influencers. Offer to let them post your infographic and write a short accompanying guest post for them to publish. NOTE: The supporting content is key to earning high-quality backlinks because Google devalues earned “embed links” if only your infographic is published. Alternatively, if you have a large following, publish the infographic on your website and promote it via social media. If your content is highly relevant to other influencers, you’ll likely earn a number of shares, “likes,” and backlinks. In either case, the quality of the data and the topic’s relevance play a large role in how effectively your infographic earns backlinks. To build a high-quality link network, you need to start with something worth linking to. That means creating great cornerstone content – content that’s so rich you can repurpose it and use it to engage customers throughout your sales funnel and to encourage a variety of actions. White papers are among the best types of cornerstone content. These robust resources provide your audience with an in-depth examination of topics that really matter to them. They deliver a potent one-two punch of content that both builds your credibility and solves customer pain points. Forty-two percent of the responding SEO experts have created white papers and 60% of those find them to be ideal content for earning links. However, as with infographics, content quality is key. Our best way to create a high link profile for our websites is simply by creating great, unique content. Our sites are B2B and informational, so our internal editors post a lot of content to help our readers succeed in their business, articles that cover unique information and are worthy of being shared. 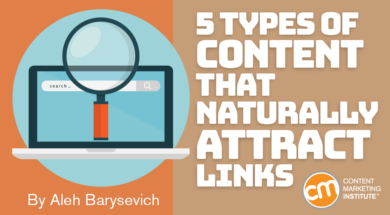 Great content is the most natural way to earn links. We also link internally to older articles if they offer added value for our readers or more information on the topic they are interested in, so we always keep in mind the importance of internal linking. This also helps us with user/reader engagement. Pick a topic that appeals to your audience and satisfies a pressing need. (Yes, this is Step 1 for every type of content). Don’t go overboard on branding. A white paper is not a brochure to advertise your business; it is a resource meant to solve a problem. Endeavor to inform and convince your readers. Present information logically and objectively. Your arguments should flow toward your concluding argument. Claims should be well supported and sourced. Include visual aids. Remember that graphs and charts are content too. Revise until it’s perfect. The editing process is more important than ever in long-form content like this. Fix wordiness, spelling mistakes, and any meandering thoughts. Fortunately, white papers and e-books are some of those valuable pieces of content that practically sell themselves. If you truly hit on an important need facing your audience, people are all too happy to share and link to your white paper. In our survey, the absolute leaders in terms of popular link-building methods were social media techniques, such as including links in social media profiles and sharing original content. If you want to build links via social media techniques, investing in a white paper as a key cornerstone asset is a good place to start. Last month my Twitter feed was abuzz about the new Content Marketing Institute’s Benchmarks, Budgets, and Trends report – and with good reason. According to our survey, when it comes to building links nothing beats unveiling new industry data and research in your niche. However, it’s worth noting that even though 70% of our respondents find data and research to be the most efficient type of content for building your link profile, only 54% have done it. The reason is simple: Creating studies and compiling original research takes a lot of time and planning. It’s OK to do promotion to tell people about your content, but if you can only get links by offering money to people or other big incentives, then you’re likely doing it wrong. One of the best ways to get links is to publish original research. That’s not that hard to do. Find out a question that people have in your industry and then do something to answer that question with data. Great premise. Again, you need to ask a question that’s burning in your audience members’ minds and create something they want to share, tweet, and reference. Ideally, this idea will impact your industry and will engage and interest many companies. Credibility. Establish yourself in your niche before making authoritative contributions. You may need to create multiple reports before you start turning heads. Pre-business market tests. Once you have a killer premise, it’s important to test the potential value of an idea. Test consumer interest online or check in with your customer service department to see what information customers are burning to know. Large sample size. We polled 628 SEO experts to make the study more properly representative of SEOs across industries. If we had polled 10 SEOs and published a report, we wouldn’t have been able to accurately draw conclusions. Clear content strategy. Yes, as with all other types of content, you want to go in with a plan. Before you begin compiling stats, figure out the goal of your survey, how you plan to use the data, and what impact you hope your survey will have. Part of the reason data and research work well as cornerstone content is because they’re versatile. You can repurpose your original research into all the other types of content, including the other four listed in this post. Have a ton of stats and percentages to share? Turn them into an infographic. Did you gain some game-changing new knowledge? Publish a white paper. Have insights that can solve various pain points? Create a video series. The potential is limitless. I didn’t realize until we finished compiling the survey data that webinars are outliers in link building. In fact, webinars wound up being a relatively inefficient type of content for earning backlinks, with only 56% of respondents finding any success with them. However, when you stop to think about how most marketers use webinars, the low link-building rate makes a little more sense. Most businesses use webinars to develop mid-funnel relationships with consumers. This format often provides additional information, addresses some of their lingering pain points, or engages with them in a more dynamic Q&A format. What marketers usually are not doing with webinars is actively building their link profile. However, that’s not to say you can’t use webinars to build links, you just need to get creative. For example, feature industry-leading influencers in your webinars. Those voices can earn you more credibility and backlinks, and boost your brand in the long run. The key to doing (link-building outreach) the right way though is not to worry about the quantity of where you publish, but worry about the quality of where you publish. In any given market space, you might have 10, 20, maybe 30 sites that are worth publishing on. So think more about that, than masses and masses of different domains. Include clickable links in your webinar. Embed the links or use a chat feature so your viewers can actively participate in your content – which is especially great during product demos. Promote your webinar to the bitter end. Announce the opportunity on social media well before the webinar date and continue to promote it as it goes live. Include information about it on your blog, in your email lists, and in your PPC campaigns (if you have the budget). Send surveys after your webinar. Gauge how much your webinar benefited your audience by asking questions. Include a CTA that tells your audience what the next steps are. Videos are another type of popular content when it comes to rounding out your link profile. Fifty-nine percent of SEO experts say they have used video content for link building, and two-thirds of those find them to be efficient. Of course, the internet is so inundated with video content these days that it can be tough to get noticed. You need to get inside of your audience members’ heads – and create content with a full understanding of what drives them, frustrates them, and makes them laugh. Then you need to spend the time, effort, and budget to get your videos just right. “Our approach to link building is ‘Let’s put out information.’ We publish the information, generally with social media, to the community we’re targeting. And then, if (our audiences) like it, they’ll link to it. Use videos to address customer pain points. If your earlier outreach hasn’t elicited sufficient pain points, use other resources like Quora to find commonly asked questions in your industry that you can answer. Develop your brand through your video content. Keep quality high and stick to a formula (e.g., include a signature bumper) that your viewers can recognize. Always include a clear call to share. If you’re publishing on YouTube, you can use its cards and end screen features. Optimize your videos. On YouTube, this means verifying your account, including custom thumbnails, and including summaries of your videos. You can even upload transcripts. Promote your videos periodically. Use Twitter, Facebook, Instagram, or any other platforms your audience frequents to earn views and shares. After you optimize your content for YouTube and rake in some views, I recommend natively hosting your best video content on your landing pages as well. You can then use link-tracking software to find people who have linked to your YouTube videos and send them a friendly request to switch their links to your landing pages. What types of content should you focus on if you want to build your link profile? According to our survey of SEO professionals, the most efficient types of content are original research, infographics, and videos. The common thread I see in all these content types is their potential to go viral. All these formats have the capacity to offer valuable information that is easily digestible and eminently shareable. Have you successfully built your link profile using other types of content? I’d love to hear about it in the comments. Need some help as you plan to have a successful content marketing strategy and effective implementation in 2018? Access the hundreds of presentations from Content Marketing World 2017. You can watch a presentation any time you have 60 minutes to spare.